The latest addition to my collection is a long sought after game, Bally Skyrocket, released in May 1971. 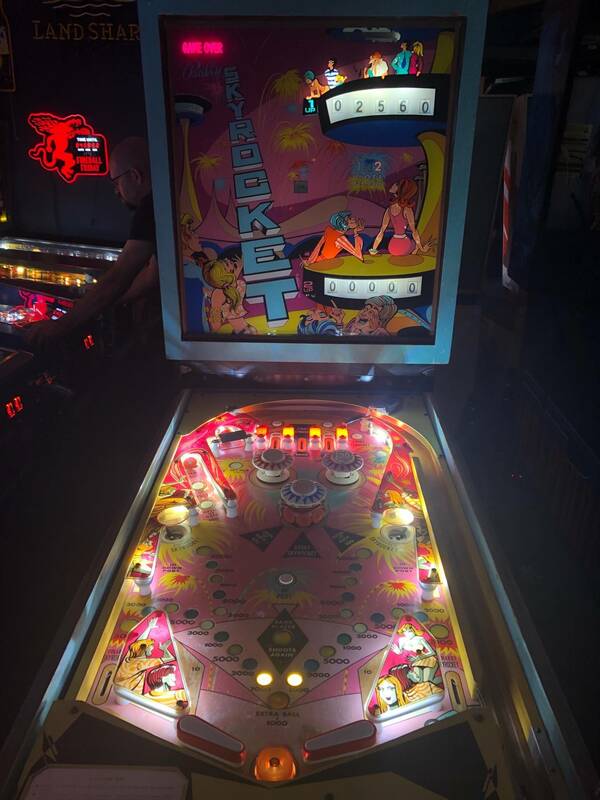 I had just turned 6 years old when it hit the streets and it would be another 47 years until I would play the game for the first time at the Roanoke Pinball Museum in Roanoke, VA. I'm not sure what started my desire to find this game but 3-1/2 years ago, I added it to my wish list. In that time, I missed one on eBay in Florida, a CL seller in Arkansas disappeared, an Indiana ad was read too late and a rough example in an auction early this year was passed on. Considering how many Pinsiders are looking for this game, I was convinced it was going to be a long wait. This Skyrocket was purchased sometime in the early 1980's by the sellers' father and has been in the family for about 35 years. The family also had a 1972 Williams Olympic Hockey but sold it sometime ago. 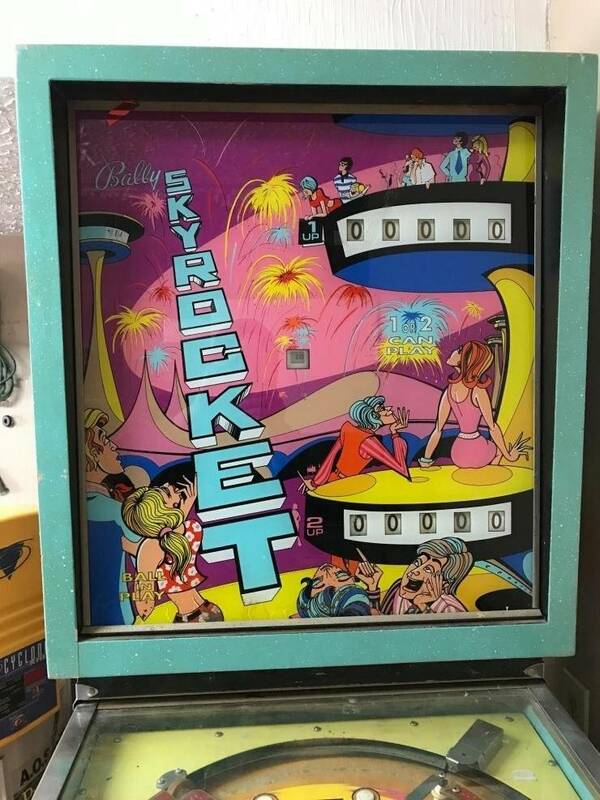 The seller was *slightly* considering turning Skyrocket into a coffee table but because the art and colors of the game are so appealing, he sought out Pinside and decided the game should be preserved and sold to a person that would appreciate the game. 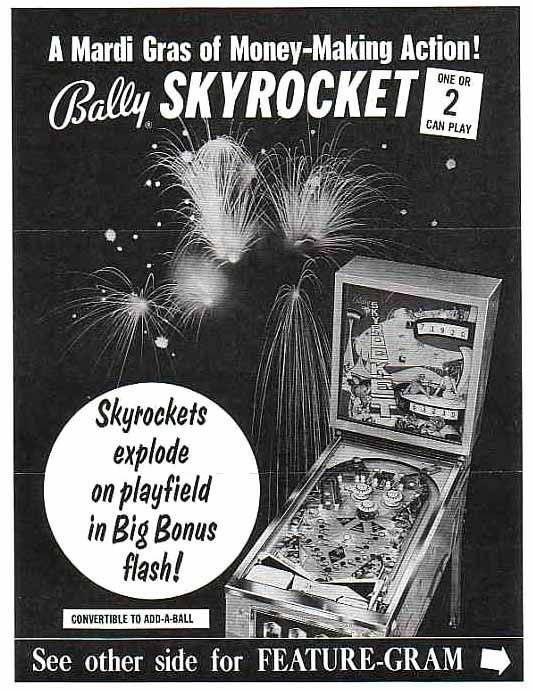 Skyrocket has a low production run of 545 units but I am curious how that can be since Bally's serial numbers start at 1001 and my game has matching number 2030. There is another game on IPDB with number 1640. 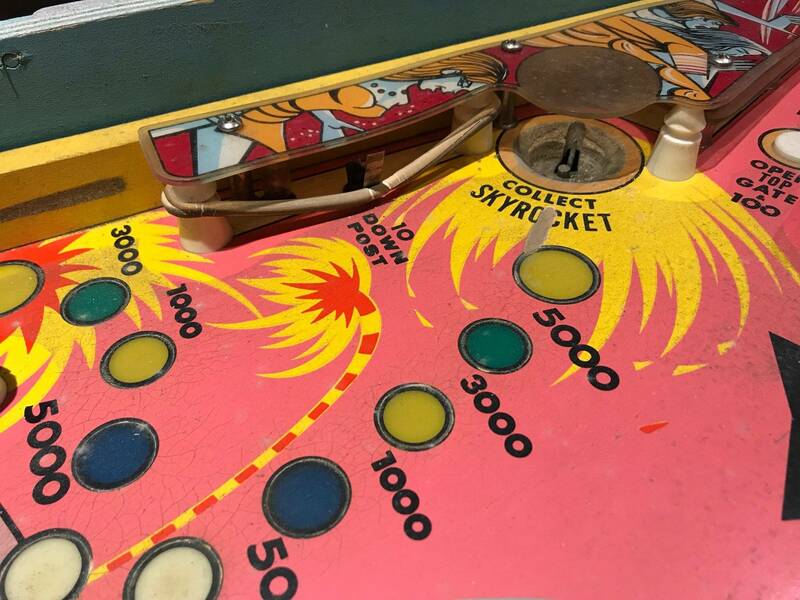 The main and COOLEST feature of Skyrocket is the cascade of colored inserts on the playfield that light in sequence to replicate an exploding firework shell. 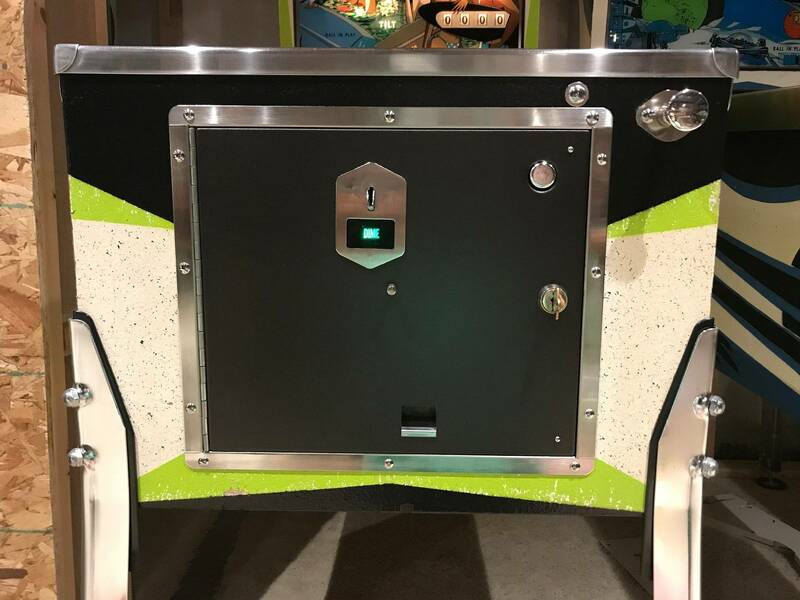 The 10 step motorized sequence of lights can score 1000, 3000, 5000 or an Extra Ball when the lit value is collected by shooting the ball into either the left or right saucer or through the left or right outlane. Here is a great game play video of Skyrocket. My Skyrocket is going to take time and passion to bring it back to it's former glory. 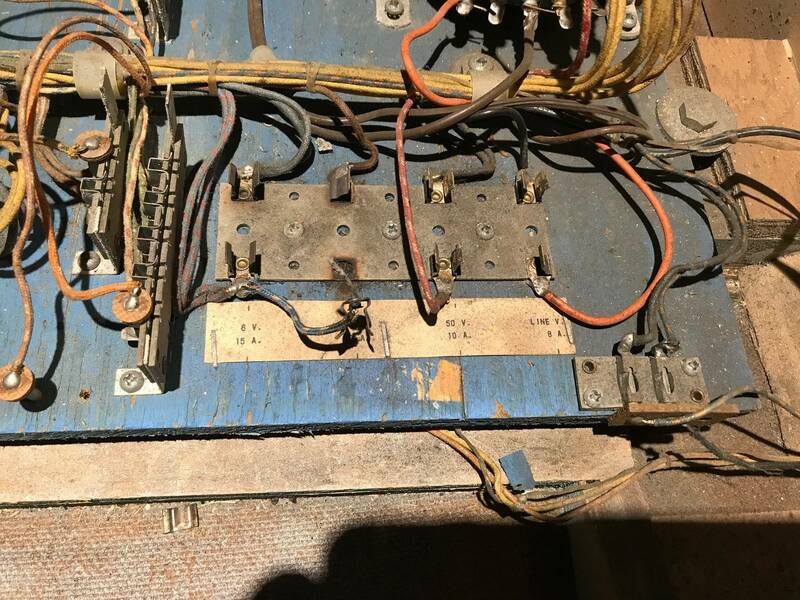 Follow along as I give this great Bally classic a loving restoration. My Skyrocket's serial number is 1564. So, here is the starting point. The cabinet is solid and in very nice condition with only some minor flaking and a few dings and names carved into the sides. The colors of mint green, yellow and magenta are vibrant and there is very little, if any, fade. I removed the outer layer of funk with Mean Green and Magic Eraser and kept cleaning until the paper towels stayed white. I have matched the colors through paint chip cards and will be doing some minor touchups. The Backglass is good condition with the typical flaking of some reds and along the bottom. I will lightly clean the backside and then lock everything in with Triple Thick. After that has cured, I will clean the front of the glass and hand polish the metal trim. The original 28-1/2" legs were very rusty and after dipping 2 of them in Evaporust for 24 hours, I found the pitting to be too much for a game of this caliber. Enter PBR and my standard procedure of new chrome non-ribbed legs with 28-1/2" in the front and 31" in the rear so I don't have to jack up the rear levelers. The game is up on mis-matched legs now until my order arrives later today. In the past, I would buy new leg bolts since the old ones are usually rusty or oxidized. Now, I prefer to refinish old bolts by wire wheel then chuck up in a drill and sand with 120, then 220, then 400, then 600 grit sandpaper and finish off on the buffing wheel to a mirror finish. This game had no bolts and I am fresh out of old bolts so it will also get new bolts. I also ordered a set of yellow pincab protectors to cover up the damage. 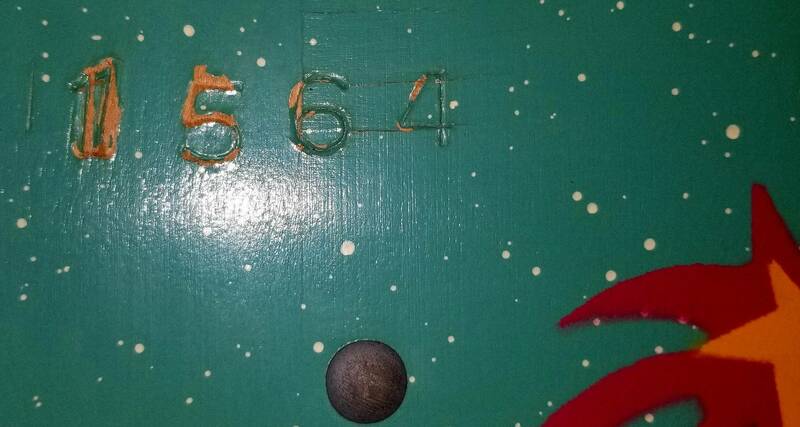 The coin door will be sanded, primed and painted a metallic oil rubbed bronze. The shooter rod, coin door trim and all bolts and rest of the cabinet bolts will get the same refinishing to a mirror shine. This playfield may be the first I have sent out to be cleared. Plastics are nice with no breaks...just dirty and need to be flattened. All new fuse holders have been replaced and a new 14' line cord attached. Correct fuse values will be installed and then we will be ready for the smoke test and see what the game does or does not do. Love those early Bally EM games! Keep on restoring them! I like it. Only EM I have is 2-in-1, years older than that. 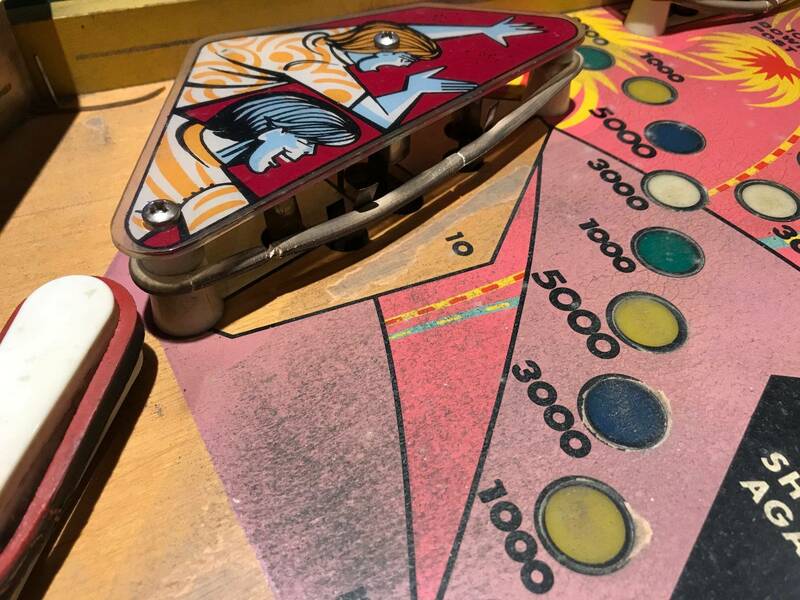 I REALLY like the backglass and playfield art, and the cabinet is quite colorful. Pretty game. I'm glad to see someone restoring this one and excited about it! Great story and nice machine. Careful with that magic eraser. May want to clean with Naphtha and Novus and see the results before you move forward with M.E. Cool game. I have never seen one of those. I'll be interested to see how your coin door comes out. I have that same door, albeit with three coin slots, on my Bally Surfers. It's scratched up and in need of help. I'm going to completely repaint the game in the future so I'll be watching this to see how your work on it comes on. So you don't want to use the original Bally dark gray painted legs? I kind of like the look of them over the chrome, I have three Bally games and I put those on all three of the games. Sold mine. Felt that it should be with someone who collects Ballys. Kinda wished I hadn’t. I'm not sure what started my desire to find this game but 3-1/2 years ago, I added it to my wish list. In that time, I missed one on eBay in Florida, a CL seller in Arkansas disappeared, an Indiana ad was read too late and a rough example in an auction early this year was passed on. Considering how many Pinsiders are looking for this game, I was convinced it was going to be a long wait. I had to wait more than 5-6 yrs before i found mine. Found it on CL in Bay Area in 2009.
but definitely worth it all in the end. One of my favorite Bally's. It is staying in my permanent collection. I had been aggressively looking for one since playing Nico’s beautiful example at TPF. I picked mine up locally (15 mins away) on Craigslist last year. Non-working and DIRTY as hell. 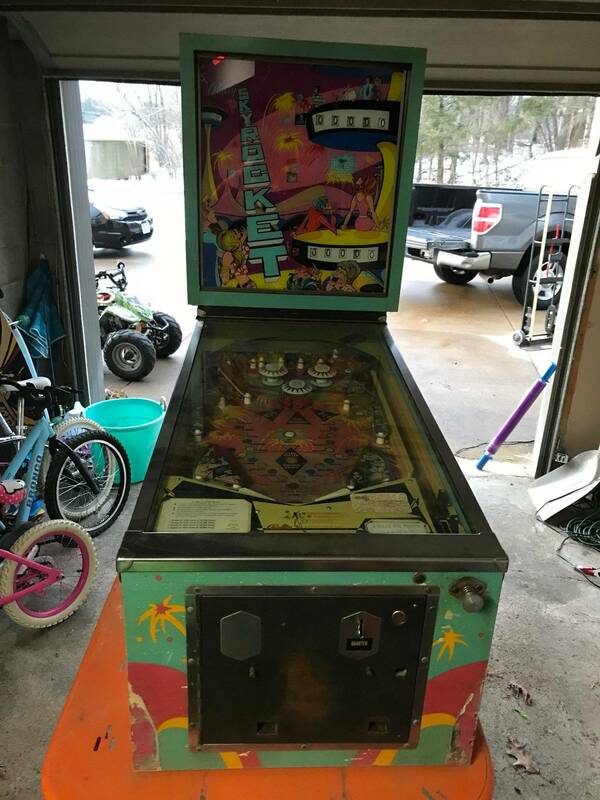 It was on CL for 24 hrs before MY WIFE mentioned it while looking thru pinball ads. I couldn’t believe it when she said “an old EM called Skyrocket. You interested???”. I would have been SO pissed if I would have missed it! Congrats on your score by the way! I know that chrome legs are not original to Bally's but I sure do like the look with all the other chrome. 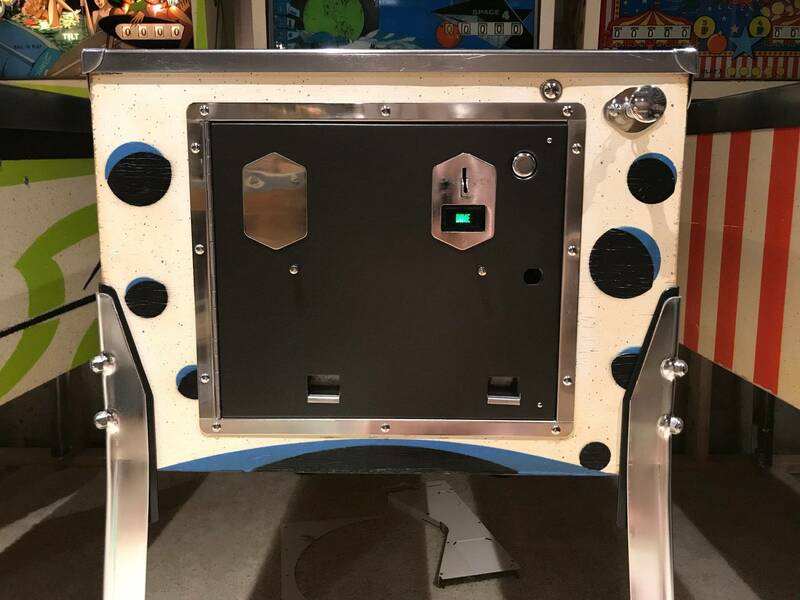 Here are the coin doors on Surfers and Cosmos that I painted with the Metallic Oil Rubbed Bronze. It has a satin finish with tiny colored sparkles. Haha. electrocute, it was your Skyrocket that you sold on eBay years ago that I would have bought if you were closer. You have some great EM videos on youtube. I especially like you flippin' the bird on that center drain. John is the tireless miracle worker, matching lonely pins to lonelier pinheads. I changed my avatar to reflect one of the the next Bally EM's I'd like to acquire. I'll settle for most any Bally. Except Toro. Congrats & glad to be your source of inspiration. 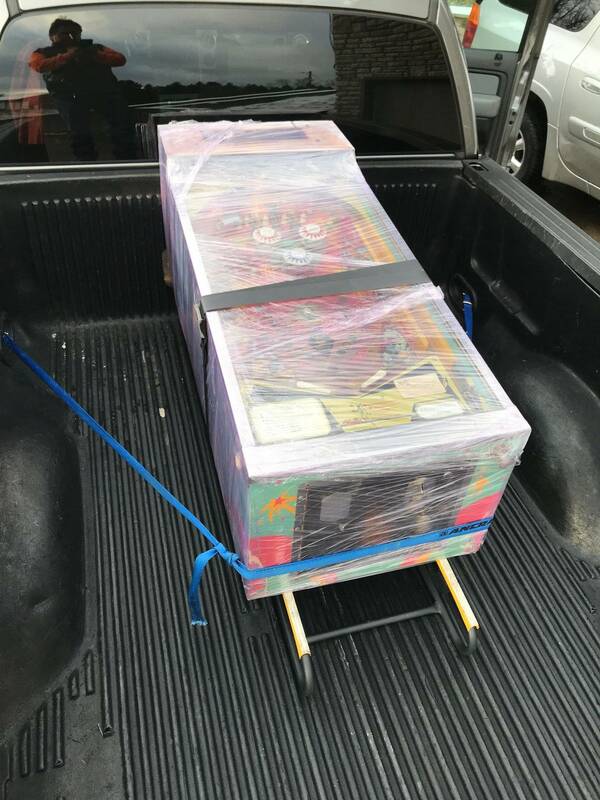 I picked mine up from a Pinsider shortly after volunteering for Arcade Expo 2.0 and getting their Skyrocket running again. Aha! I need this one! It wasn't for sale and was 1000 miles away but I figured why not reach out and see if he was tired of it? Turns out he was. $1100 plus shipping and it was mine. 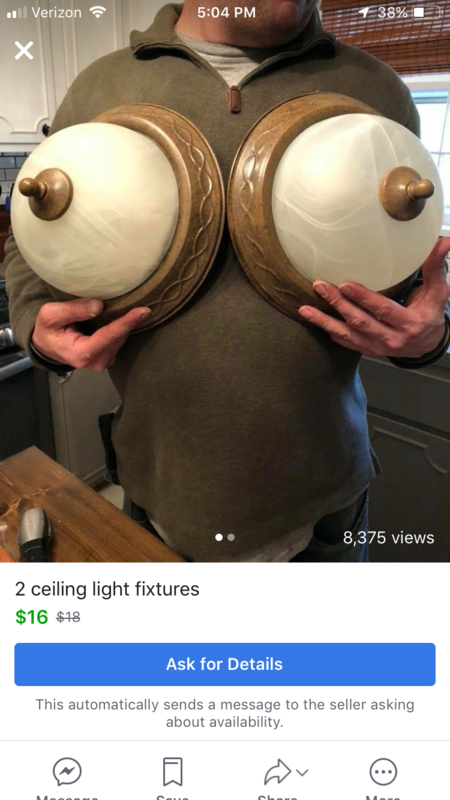 Then another $600 for clear coat and maybe $125 in various parts including fully replacing all of the lamp sockets (in the head too... woo... those Ballys...). Totally worth it. Rare, fun, pretty, and has an interesting history. Also multiplayer fun in a single-player form factor. Never sell it! Me too ! I played Nic’s game last year and it became a grail game for me !! 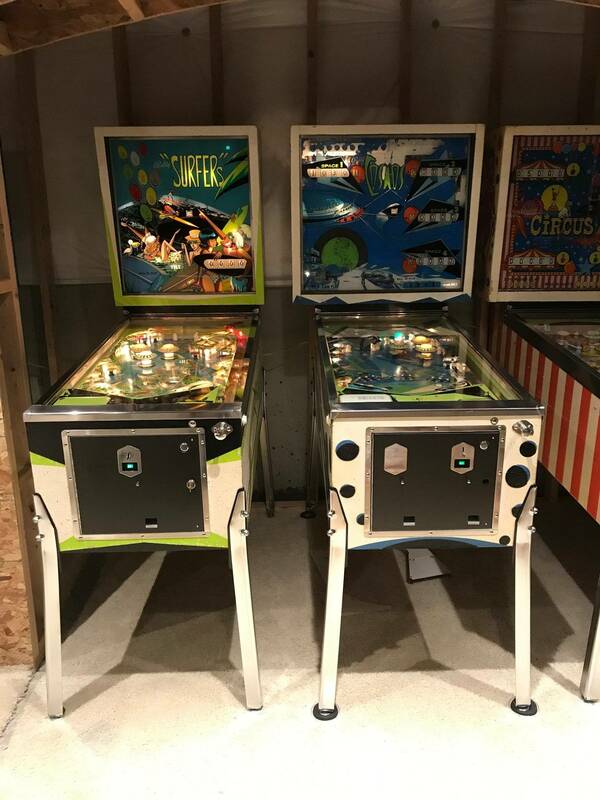 Sorry for the lack of updates on the Skyrocket (and 3 In Line) restorations but I have been busy the last two weeks with improvements to the pin area in the basement. 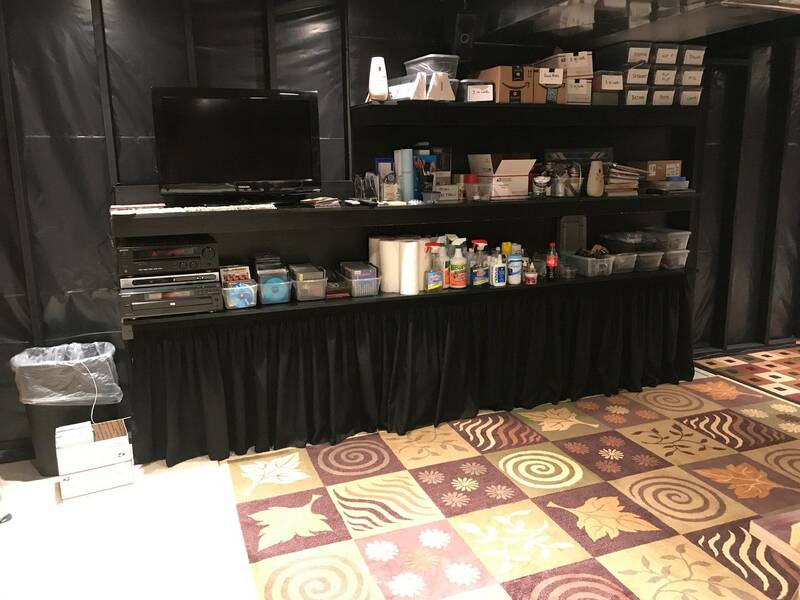 New shelving to organize parts and shop supplies, surround stereo, flat screen, wall coverings and furniture. Still have more to do including new carpet and re configuring a storage area with sound and dust control of the tumbler and bench grinder. It doesn't help that spring is finally here and all the exterior cleanup and projects that have popped up. If I didn't already have can lights in the ceiling, I could have sprung for these. Not sure if they are 110 volt or run on D batteries. Anywho, I had to correct for my lack of measuring the height of the front of the game when I ordered new 28-1/2" front legs. Turns out that I needed 27" legs in front to maintain a low 36" to 37" height and keep it in line with the rest of my games. I'm short and too old to be standing on a milk crate to play pinball. 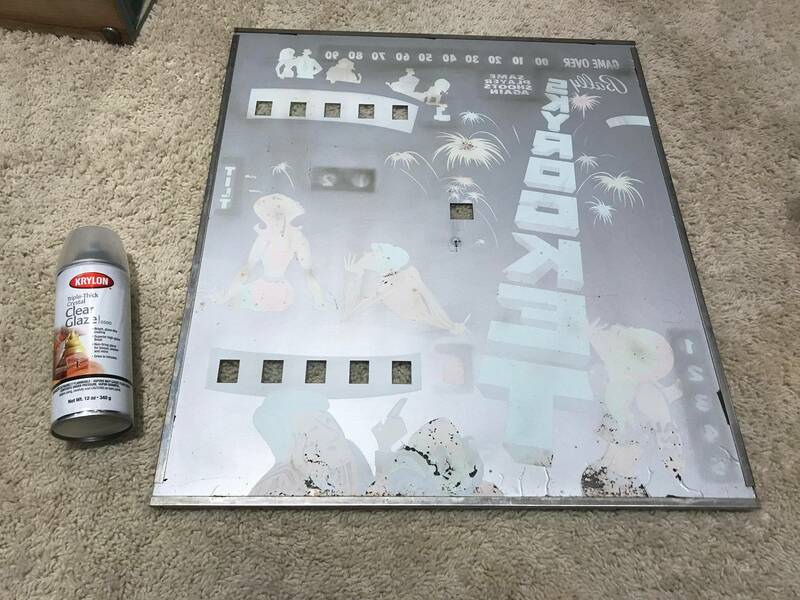 I also completed the gross task of taking apart the playfield glass frame and cleaning 48 years worth of spilled beverages and dirt caught in the rubber gaskets and frame pieces. While I should take these pieces to my local commercial buffer, I will just do some hand buffing and re-graining and re-assemble with a new 21" x 41-1/2" tempered glass I ordered. Their pricing wasn't the only insult...they couldn't even spell my name right. Dang... $75 a sheet is sheet! Should have taken Ivan's offer of about $ 45 picked up at Allentown. 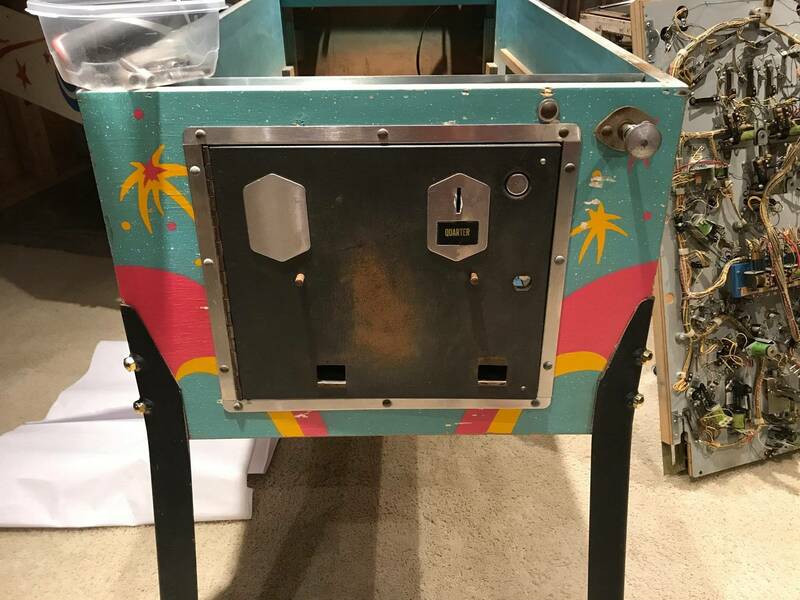 Can you guys recommend someone who could do my worn playfield justice? 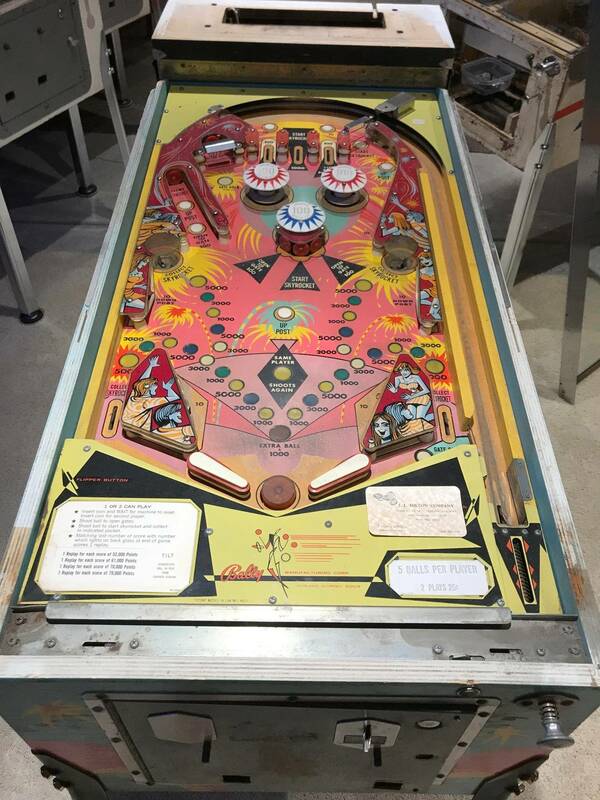 Or know of a nice playfield for sale????? So many of you have said how great this pin is, that I just added it to my wishlist. First, Have you installed the new glass in the frame to confirm that the glass fits? These are the dimensions on the Marco website so I suspect that they are accurate. It's my understanding that installing the glass from the head's end is the much easier approach than from the player's end. Second, Was Ivan's $45 price for this nonstandard dimension glass or just for the standard glass size? Third, What is Ivan's Pinside identity or other contact information (please PM me). The easy way is to take the frame completely apart, lie it upside down on the floor, and then put it all back together. 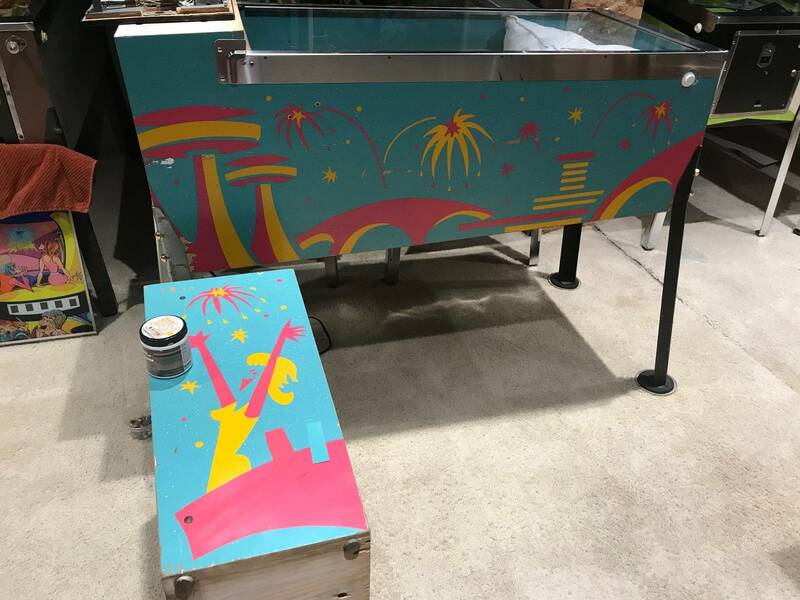 The glass has a vinyl channel piece on all four sides that you need to install before reassembling the frame. I just sent you a PM. Ivan is Ivan1496 here on pinside. Actually $ 42 for non-standard. He might still be able to get it made by Pinfest. $ 35 for standard and then $29 if you buy 5. Yes, I did confirm that the glass is 21" x 41-1/2" that fits in the Bally "Chop-Top" frame. Thanks. 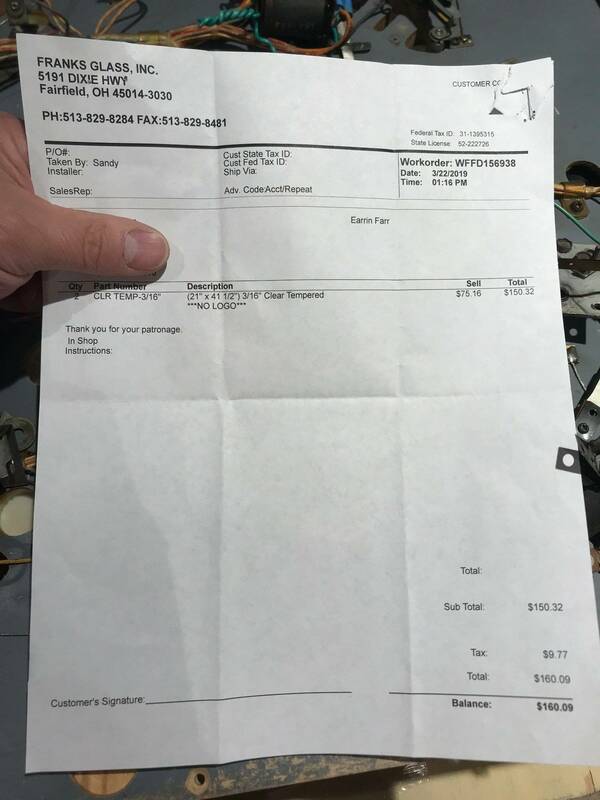 I ordered 5 sheets at $45/sheet, in time for retrieval at Pinfest. I got one too! Thanks Ivan! Guess I better order 2 myself.